If you’re not already familiar with the term 4K, it’s a buzzword that’s being used by many camera manufacturers to denote models that feature ultra high resolution video capture. Equivalent to twice the resolution of full HD video, 4K video (3840×2160 pixels) is mightily impressive when it’s viewed up against full HD video (1920×1080 pixels) and if you’re yet to see the true benefit of 4K it’s well worth walking into your local television store to see for yourself the direction in which the future of TV and video appears to be heading. So why all the fuss about 4K video? Well, besides the fact 4K is superior to full HD, it has more to offer than just being a video mode. This is something we discovered when we reviewed Panasonic’s Lumix GH4 last year and used it to successfully extract an 8-million pixel image directly from a clip of 4K footage. Having the option to pull an individual frame from a movie clip to create a high resolution still image can be an very useful feature to have if you like to shoot fast action, sports or other fleeting moments where it’s not always easy to trigger the shutter at the perfect moment. I’m the first to admit that taking a video to pick out the best frame later doesn’t require the same level of skill or technical ability, but nevertheless it’s technology we’re already seeing photographers embrace and it’s an innovation that certainly looks like it’s here to stay in the long-term. Panasonic has looked to enhance its 4K video and make it even more user friendly for its consumers by adding three new 4K-photo functions to its latest model – the Lumix G7. Before finding out how these work and whether they’re a success or not, let’s take a closer look at the camera’s key features. The G7 features a revised 16-million-pixel Live MOS imaging sensor that’s paired with Panasonic’s latest Venus engine image processor. This combination provides a wide ISO range of 200-25,600 that’s expandable to ISO 100 and the sensitivity peaks at ISO 6400 when it’s switched over to movie mode. The G7 can shoot still images at a rate of up to 8 frames a second and although this is 4fps slower than the speed of the Panasonic Lumix GH4, it’s a 1fps improvement over its predecessor – the Lumix G6. Setting the Lumix G7’s autofocus to continuous (AFC) from Single (AFS) does see the frame rate drop to 6fps, however this still remains faster than most of its DSLRs rivals of similar price, which usually shoot at around 5fps. If you’d like to shoot beyond a 1/4000sec shutter speed or shoot in complete silence, the G7 also features a very useful electronic shutter, which increases the shutter speed up to a maximum of 1/16000sec. The Lumix G7 is capable of a digital signal communication of up to 240fps and the contrast-detect autofocus system has been enhanced by integrating Panasonic’s new Depth From Defocus technology (DFD) that analyses two out-of-focus areas, one from the foreground and one from the background, to hone in on the correct focus more rapidly. With compatible Lumix lenses, the G7 has a claimed lock-on speed of 0.07sec, though the focus speed with the 14-42mm kit lens is slower (0.18sec). Forty-nine precision contrast-detection AF areas can be selected either individually or in groups, while there’s also face detection, autofocus tracking and pinpoint AF – the latter being most effective when you’d like a magnified view onscreen to select your focus point with supreme accuracy. The touchscreen screen at the rear is similar to that found on the Lumix G6. It’s a 3-inch free-angle display that features a 1,040k dot resolution and displays in the 3:2 aspect ratio rather than 4:3 like the imaging sensor. Users can expect thin black lines to appear either side of the frame when composing and reviewing images, but Panasonic has taken advantage of this space by adding small touchscreen icons to offer quick access to touch shutter, creative control modes, Wi-fi and the all-new 4K photo modes that I’ll touch on shortly. 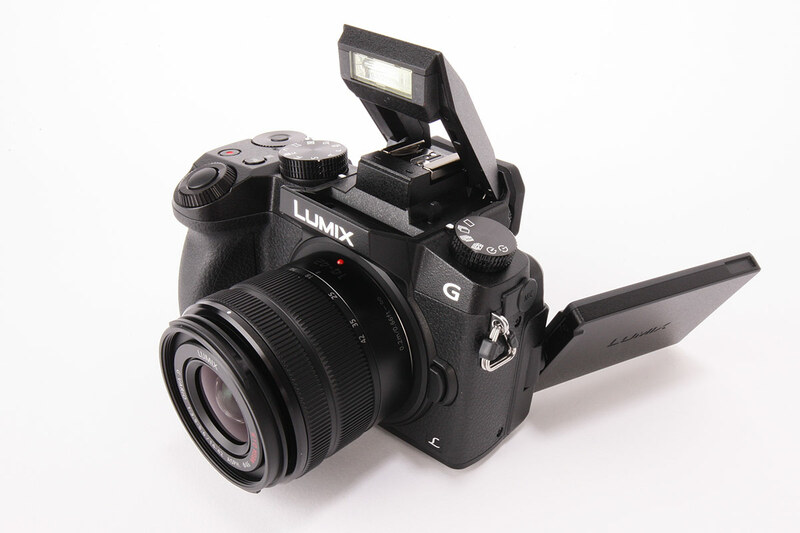 Above the screen, the G7 inherits the excellent OLED electronic viewfinder from the GH4. The resolution has jumped up to 2.36-million-dots from 1.44-million dots on the G6 and there’s a newly designed eyecup and modified sensor to improve visibility and detection when it’s raised to the eye. Just like the GH4, the G7 relies on a 1728-zone multi-pattern metering system that’s linked in to the camera’s autofocus system. Multi, centreweighted and spot-metering modes are all available, with exposure being displayed in real-time on either the EVF or the rear screen. There’s +/-5EV exposure compensation, focus peaking and Wi-fi too, however there’s no NFC connectivity present for those wishing to initiate a wireless connection by the power of touch. As for video, the G7 is capable of recording 4K video capture with full-time autofocus set to the MP4 compression. There’s the choice of 3840×2160 4K recording at 25p (50Hz) or 24p with a bit rate of 100Mbps, or alternatively Full-HD (1920×1080) at 50p in AVCHD or MP4 formats. There’s full access to all the photo styles, creative control modes and PASM exposure modes too, not forgetting control of ISO and white balance. While it’s possible to extract an 8-million-pixel still image directly from a 4K movie clip after it has been recorded, the G7 boasts three new 4K photo functions (4K burst shooting, 4K Burst (Start/Stop) and 4K Pre-burst), designed to make the process of capturing a still image at the perfect time even easier. Whereas 4K Burst Shooting allows up to 29mins 59secs of continuous shooting at 30fps, which can be used just like a photo burst mode by holding the shutter down, 4K burst (Start/Stop) mode starts consecutive shooting with a single press of a shutter button and stops with a second press – better suited to shooting opportunities that require a longer waiting time. Not forgetting the 4K pre-burst function, this is aimed at those who’d like the camera to automatically record 30 frames the second before and a second after the shutter is pressed. This mode make all the difference between capturing a moment and missing it altogether.